Given the complete absence of any quality control in science, I suspect that we 'know' even less than you think. From the standpoint of making an argument, I realize that you can concede all manner of "facts" to the alarmists and still win convincingly. Just saying that it would not surprise me at all if the shoddiness of so much of the research is eventually exposed and we learn that there is a whole lot wrong with the present understanding. It's wonderful for you to continue this fight. Strategically, I try to focus more to the policies than on the horrid pseudo-science being used to support them. Though both are worthy of attention. If the catastrophe story is true, then partial measures are worthless. 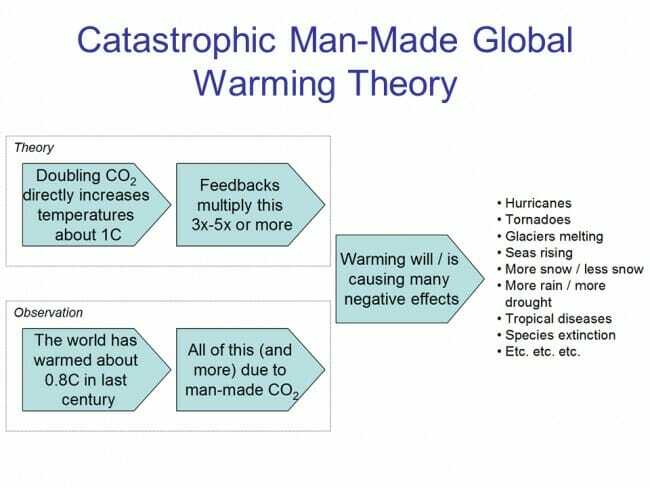 The catastrophe story is that there's a tipping point for CO2 after which the Earth is just going to be miserable to live on. If you reduce CO2 emissions, but still leave them high, then the tipping point will still be reached, just somewhat later. Truly arresting the growth of CO2 would require massive changes to society. There are no contenders for policies that would really do the trick. The ones that are getting major play are all quite bad on this score. Gas taxes will not do the trick until they are high enough to cause well over half of all vehicle transportation to stop: that includes private automobiles, trains, busses, and electric cars, too. So long as anything like the current fleet is out on the road, there's going to be too much energy consumed for anything but nuclear power to put a stop to the emissions. CAFE and Energy Star fall down, as well. The devices they regulate are already reasonably efficient. Further requirements make the devices more expensive--and thus are a gift to the folks creating them--but do little to reduce energy usage. If you include the manufacturing of the devices, then the energy usage often goes net up over the life of the device. Alternate energy sources aren't going to do it unless they replace most of the existing power plants. Nuclear can do that, as far as I know, but solar, wind, water, and geothermal are all just way too limited. Finally, there's a distinct lack of emphasis on CO2 sequestration. It's hypocritical to say that CO2 is important, but only when it applies to my favorite pet projects. If it's important then it's important, and we should be fighting it. So where are the calls for work on sequestration? It affects CO2 from all sources, and it should be effective if the technology is improved. Sequestration should be the first solution attempted, not the last. Not for someone who thinks CO2 is dangerous. The "dominated by positive feedbacks" premise is what I call "as cockeyed as Trenco's ether", because if the real world did have strong positive feedbacks it would be as uninhabitable as the planet Trenco in the Lensman universe, with wild excursions in both climate and weather in response to small stimuli. There is solid scientific evidence that the positive feedbacks know that they are only supposed to kick in when the warming is due to CO2 induced warming. Positive feedbacks have a unique inherit ability to differentiate between the different causes of warming. In fact the positive feedbacks have demonstrated that ability by remaining dormant during any of the prior warming periods yet knowing they will emerge to wreck havoc during any human caused co2 warming. FYI - the aforementioned explanation officially qualifies me as a renowned climate scientist. Has the earth warmed? Well of course we came out of a global cooling around 1850. Has it warmed as much as the last time we came out of a global cooling? No that would be the medieval warming period that was much warmer than this warming period. So if these warming and cooling periods are cyclical why do we think that this relatively modest warming cycle is caused by humans? Because there is an opportunity for huge power and money redistribution and those that stand to benefit from this scam will not be denied. There is no lie, no false claim, no threat or bluff that will not be made to get what they want. But what if the people are smarter than the warmies think? Bwahahahaha!!! Stop it with the science already, and just look at historical results: "A warmer world is a healthier world." Nice overview. I'm curious to see your feedbacks post. The catastrophic climate warming theory shows a 3x to 5x positive feedback. Anybody who has studied control theory knows that positive feedback of 1x or more leads to a runaway condition, driving the system to "the rails." Which, if true, we're screwed so why bother to do anything to "reduce" the problem? It can't possibly work. Until there are glaciers in Ohio again it's too hot. my explanation below sums up the logic of the AGW scientific theory of positive feedbacks. The same AGW logic applies to the 3 foot sea level rise within the next 100 years. Even though all the anctartic ice cores and greenland ice cores show significant volumes of ice during all the prior warm periods, the ice has the inherit knowledge to know it is to completely melt if the warming is human caused due to co2, but only if it is human caused warming. 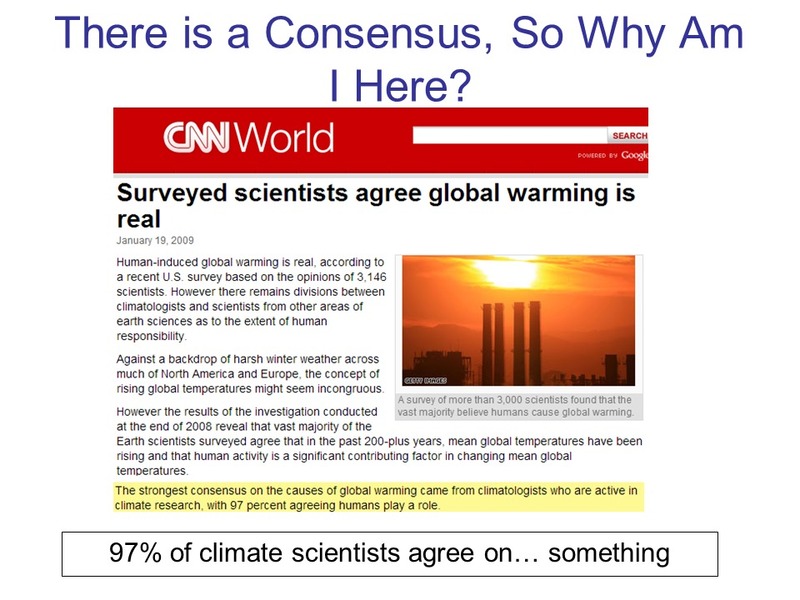 You wrote: "There is something approaching scientific consensus for certain parts of anthropogenic global warming theory -- for example, the fact that CO2 is a greenhouse gas and that concentrations of it in the atmosphere have a warming effect on the Earth is pretty much undisputed in all but the furthest reaches of the scientific community." I got a chuckle out of "in all but the furthest reaches of the scientific community". If you realize how much the "scientific community" has been corrupted, then yeah, you have to go to the far-flung outposts to find any semblance of actual science. CO2 does NOT have a "warming effect". Thinking that it does is the result of years and years of indoctrination. CO2 is a spent fuel. It is not a thermodynamic heat source. The AGW industry has spent billions to delude the public. People are convinced that atmospheric CO2 "traps" heat. It then somehow hurls that heat back to Earth, causing the surface to overheat. It's a good horror story, but fails in reality. If you do not even know what the IPCC is, or how often it meets, then I need not bother reading the rest of this. While they meet yearly, they only produce an assessment report about every 5 years or so. In what other ways did he get IPCC wrong? The IPCC is a UN body with a small permanent secretariat in Geneva. To produce one report the IPCC have an international "staff" of thousands of unpaid scientists and experts trawling through current scientific publications. The 5-yearly reports are just the tip of an iceberg of continuous reading and review of mammoth proportion to reduce and summarise all the published literature of the previous years into one document (actually three, with special summaries for policy-makers). Since the reports take a year to review and publish, a guillotine is brought down about a year before projected publication date. That means the reports may be slightly out of date when published. Totally trivial point. Why is this obviousness relevant to anything claimed here? Also, how can the reports be "out of date" if this is all already settled? One quibble -- actually more than a quibble: The author assumes that each doubling of CO2 in the atmosphere will lead to an equal increase in the temperature, other things being equal. But according the physicist Lubos Motl (former Harvard Fellow), the relationship is not linear by logarithmic (i.e., the opposite of exponential) . That is to say, while the first doubling may increase the temperature by x degrees, the second doubling will increase it by a significantly less amount. The physical reason (if I understand the argument correctly) is that there is only so much radiation being reflected back from the earth in the narrow band of wave lengths that CO2 interferes with. He likens it to painting a room while that was black before: the first coat masques most of the black, the second coat gets rid of most of the rest that is still showing through. Logarithmic is correct. But that means if CO2 goes up by a factor of 2^n, temperature goes up by a factor of n. So if CO2 goes from 300ppm to 600, temp goes up 1.5–4.5 degrees; if CO2 goes up further from 600 to 1200, temp goes up another 1.5–4.5 deg (3–9 deg total). Linear would be: CO2 goes up by a factor of n, temperature goes up by a factor of n. So if CO2 goes from 300 to 600, temp goes up 1.5–4.5 degrees; if CO2 goes up fourfold to 1200, temp also goes up fourfold: 6–18 deg total. Apart from ignorant comments about Medieval Europe, I appreciated this introduction.